A Week Long Bonus Event has been activated! Enjoy 3x Experience, 5% Refine, 5% Empowerment, 5% Reinforcement, and Unlimited GA Energy! Additionally at the start of the event, everyone will receive one free Stat and Skill reset! Please note that Stat and Skill resets will be slowly distributed throughout today (Monday May 21st). 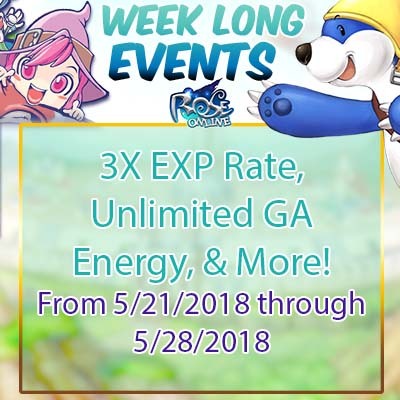 Week Long Bonus Event is on now through Monday, May 28th! I noticed the same thing and have sent a message about this to the support team. I'll update here when I hear any news. Thanks for the report! Edited by AndraSyte, 22 May 2018 - 08:21 AM. Skill and stat resets should now be distributed to everyone who didn't get them yesterday - please let us know if you still don't have them and we'll investigate further. Please send a ticket to the Support Team here so that they can assist. Good for you. Im on premium smh. Thanks for the report. Unlimited GA Energy should be turned on again now.